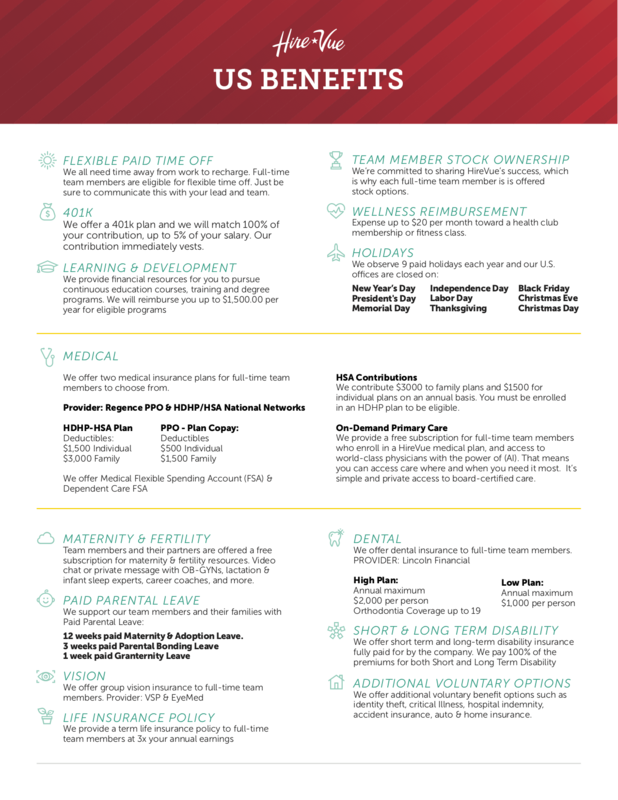 Compensation: Amazing Salary + annual bonus + 401K + stock options + flexible vacation + medical + dental/vision + relocation. If you're an engineering leader who believes in helping teams deliver value to customers quickly and sustainably then keep reading! Our team is growing and we're looking to add an additional Director to our amazing team here in Salt Lake City, Utah. I know your current team is probably great but you haven’t met ours yet. When you do, take some time and say goodbye to your “co-workers” but invite your “friends” to come on over for a visit. Education Reimbursement, gym membership, Flexible Vacation. See list and link to document below for full benefits! You'll be responsible for a group of teams working on HireVue's core system. With those teams you'll define direction for infrastructure, backend applications, and front end applications. You'll coordinate work with our Product Managers, Product Designers, and engineering leaders to make sure we have the right platform to build on. We want our teams to work independently and remove roadblocks as they deliver customer value. Our current stack is Backend: Python, Django, Celery, Go, WebRTC; Frontend: React, HTML (JSX), CSS (in JS), GraphQL; Storage: PostgreSQL, S3, Elasticsearch. Most of our infrastructure is on AWS so it is a huge plus if you know and love AWS. Don’t worry about it. Your current company will find someone else and you will be off singing a happy tune. Every engineer says “They are happy” – of course you are, but you’ll be happier here. And all your old “co-workers” will be jealous putting in their 60+ hours a week while you are building stuff, playing and doing the things you love with your flexible time off! Remember to invite your “friends”. We have Mountain Bikers, Road Bikers, Skiers / Boarders (dawn patrol & resort), Runners, Video Game heroes, Movie Buffs, Musicians, and every other variety of people. We have Family people, Single people, Happy people. You will find a friend here and like we said bring your friends too. Don’t ignore this opportunity. Don’t be scared of change. Don’t worry about your current employer, sometimes you have to move on and we encourage it too. We have amazing alumni at Amazon, Linkedin, Google and more. By the way – they still love HireVue! At HireVue, our Hiring Intelligence platform is transforming the way companies discover, hire, and develop talent. By combining video interviews with predictive, validated I-O science and artificial intelligence, HireVue augments human decision-making in the hiring process and delivers higher quality talent, faster. HireVue is transforming the way companies discover, hire, and develop the best talent through Hiring Intelligence and its HireVue Video Interviewing platform. Our more than 700 customers worldwide include over one-third of the Fortune 100 and leading brands such as Unilever, Hilton, JP Morgan Chase, Delta Air Lines, Vodafone, Carnival Cruise Line, and Goldman Sachs. HireVue is committed to equal treatment and opportunity in all aspects of recruitment, selection, and employment without regard to gender, race, religion, national origin, ethnicity, disability, gender identity/expression, sexual orientation, veteran or military status, or any other category protected under the law. *HireVue does not sponsor employees requiring a work visa at this time.